Clustered Data ONTAP is the answer to storage challenges for organizations of all kinds. These two success stories explain why two scientific organizations chose clustered Data ONTAP and how NetApp Services helped them make the move from their previous storage. Would you like to learn more about operating clustered Data ONTAP? Last month's issue of Tech OnTap (April 2014) featured an article from Ryan Beaty of Zumasys with the latest tips, including how to download and use the Data ONTAP simulator, to help you come up to speed. You can also estimate how much money NetApp nondisruptive operations can save you using our NDO calculator. Figure 1) The 7-Mode to clustered Data ONTAP transition workflow. 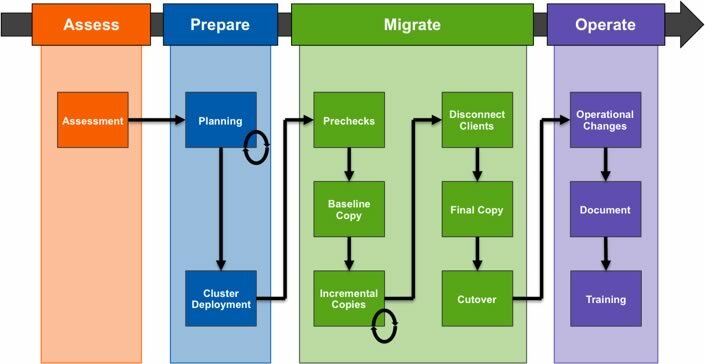 To facilitate the process of moving from 7-Mode to clustered Data ONTAP, which involves the migration of data, NetApp defined a workflow and created tools to simplify transition. The workflow breaks down the transition into four phases: Assess, Prepare, Migrate, and Operate. 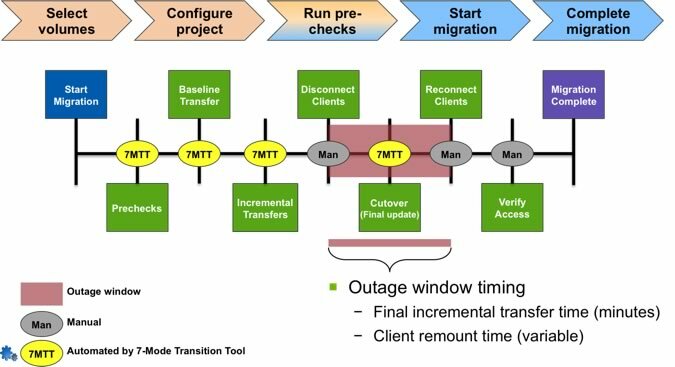 In this article we explain a little about the tools and processes we recommend in each phase, including the 7-Mode Transition Tool (7MTT), which can significantly streamline the process of migrating data. We also look at specific recommendations around migrating qtrees and SnapMirror® and SnapVault® technologies. The first step in the transition—as is common with any data movement—is to assess your existing 7-Mode environment, including all the hardware and software (NetApp and third-party) that your storage environment relies on and the workloads that the environment serves. Transition Advisor. For those of you who are AutoSupport™ users, NetApp My AutoSupport (Login required) now includes a Transition Advisor tool. This is an extremely simple tool that lets you assess a single storage system or every system you own at once. The tool generates a "feature advisory" report that tells you everything that runs on 7-Mode and whether it translates one to one with clustered Data ONTAP. For items that are different, it provides suggestions where appropriate. For instance, the 7-Mode volume prioritization feature, the FlexShare® tool, has been replaced in clustered Data ONTAP 8.2 with Storage QoS, a far superior feature. Figure 2) The Transition Advisor in My AutoSupport. 7-Mode Transition Tool. Another alternative for those unable to use My AutoSupport is the precheck assessment contained in the 7-Mode Transition Tool. This tool does a good job, but it is slightly more limited than Transition Advisor in that it assumes you are going to use 7MTT for the migration and only provides advice specific to what is supported by the 7MTT. It is important to understand that if the 7MTT does not support a particular feature or function, that does not mean that there is not another method available that does support the feature or function in question. The Prepare phase of the transition workflow focuses on developing the plan for which workloads or applications will move, when they will move, and through what methods. Identifying how and when staff will be trained should also be included in the plan. Lastly, the Prepare phase sees the deployment of the target clustered Data ONTAP environment(s) that will serve as the destination of the movement of data from the 7-Mode storage systems. Most customers find it most convenient to make the transition at the same time they do a tech refresh. Alignment with a tech refresh is simpler (and recommended) because it means that the clustered Data ONTAP environment can be deployed using the newly acquired equipment, without requiring temporary hardware. Once the new environment is in place, data is simply moved from the 7-Mode equipment to the cluster. If temporary hardware is needed, it is important to note that you just need enough to get the first 7-Mode storage systems evacuated. Once the data is moved off the source 7-Mode storage systems, they can be immediately repurposed into the destination cluster. This is where the rubber meets the road, and most likely this is the part of the article you've been most eager to read. The 7MTT is a no-cost tool that NetApp offers to simplify and accelerate the movement of data from 7-Mode to clustered Data ONTAP. (You can download the tool here. Login is required.) We've been updating this tool frequently, with a new release every four months or so, which allows us to quickly add key features and functionality. Retains existing Snapshot copies. Any Snapshot™ copies you had before the migration will be there when you finish. Maintains storage efficiency. Data compression and deduplication savings are maintained throughout the migration. This not only saves storage space at the destination, it means that less data has to be copied over the network. Thin provisioning settings are also maintained. Migrates existing SnapMirror relationships. 7MTT can migrate your volume SnapMirror relationships without having to rebaseline (transfer all the data from primary to secondary). The 7MTT helps you move the secondary volume to clustered Data ONTAP first, followed by the primary volume. The disaster recovery relationship is maintained throughout the migration process. Because the primary and secondary volumes share a common Snapshot copy, the SnapMirror relationship in clustered Data ONTAP requires only a resync to reestablish the DR relationship, saving significant time in establishing the clustered Data ONTAP SnapMirror relationships. Figure 3) The 7MTT process illustrating both automated and manual steps. 7MTT minimizes the time that your data is offline by first doing a baseline SnapMirror transfer. When the baseline is complete the tool starts performing incremental updates based on the timetable you set. During this time, the primary 7-Mode volume is online and continues to serve data as normal. Incremental updates continue until you decide to cut over, which is the only time when clients see an outage. The amount of time needed to cut over depends on the time needed to finish an incremental update. This obviously depends on the rate of change in the volume, but three to four minutes is typical to complete the final incremental update. Final incremental update time (generally three to four minutes). Client remount/reconnection and/or application restart time. Reconfiguration of items that could not be configured in clustered Data ONTAP ahead of time. Note that the 7MTT automates the majority of reconfiguration for you. Of course, there's no general guideline on how long it takes to redirect clients and restart application services after cutover. It is typically how much time application restart or client remount/reconnection takes. Increasingly, applications themselves have migration capabilities that allow you to minimize or eliminate application downtime. A few of these options follow. Microsoft® Exchange has database availability groups (DAGs). You can establish a DAG on clustered Data ONTAP and cut over to Exchange without disruption. VMware has Storage vMotion®. It's considered a best practice to use Storage vMotion to migrate VMware® environments. The only drawback to this approach is that, since it's essentially a logical data copy, Snapshot copies and storage efficiency savings aren't retained; storage efficiency will need to be reapplied at the destination. Oracle® Automatic Storage Management can be used to migrate Oracle Database data. Currently, NetApp offers the DTA2800 as the best LUN migration tool for moving this data from 7-Mode to clustered Data ONTAP while minimizing downtime. It supports both online and offline FC and iSCSI SAN data migrations. The DTA2800 can be used not only for 7-Mode to clustered Data ONTAP migration, but also for migrating from third-party storage as well. The DTA2800 uses a 1U chassis with two hot-swappable blades. Each blade is capable of transferring about 4TB/hr. Check out the available DTA2800 documentation for more details. As we said in the introduction, there are three features in 7-Mode that generate a lot of questions when it comes to the transition to clustered Data ONTAP: qtrees, SnapMirror, and SnapVault. As you can tell from the preceding discussion, 7MTT takes care of volume SnapMirror quite nicely. The other two are discussed below. Data ONTAP 7-Mode also provides qtree-level SnapMirror, but this capability is not part of clustered Data ONTAP. If you currently replicate qtrees in 7-Mode, qtrees that don't have the same replication schedule will need to be broken out into different volumes, either individually or with other qtrees that share the same replication schedule. If you want to take advantage of these features, you may want to evaluate your current qtree configuration and determine if it needs to be reorganized. In relation to qtrees, you should also note that exports work differently in clustered Data ONTAP; they are policy based and greatly simplified. A source of confusion has been the "number" of exports supported with clustered Data ONTAP. The number you often hear cited is the number of export policies we support, not the number of individual export rules, and you can have many, many individual rules per policy, so the limit is actually much higher. For VMware users, there's a tech report on vSphere best practices, TR-4068, that describes how to use export policies and rules most effectively. SnapVault. SnapVault exists in clustered Data ONTAP; however, SnapVault in 7-Mode is qtree based, whereas SnapVault in clustered Data ONTAP is volume based and is able to retain storage efficiency savings during transfers. From the perspective of the primary volume, there's no change. From the perspective of the secondary—vault—volume you end up creating a new clustered Data ONTAP vault that requires a baseline (because it is a net-new relationship). This raises the question of what to do with all the data stored in the 7-Mode vault. If you keep data for less than three months we recommend that you keep the 7-Mode system in place for three months until you build up the necessary retention cycle in the clustered Data ONTAP vault. If you need to restore from the 7-Mode vault during that time, you simply mount the Snapshot copy from the 7-Mode vault and copy out the data you need to restore. If you need to retain your SnapVault data for more than three months (more common), you again start a new vault on the clustered Data ONTAP system, but you also migrate the existing 7-Mode vault to the clustered Data ONTAP system into a separate volume (from the clustered Data ONTAP vault). In that way you can get rid of your 7-Mode equipment and still have access to data in the 7-Mode vault for restore if necessary. Again, you have to mount the Snapshot copies from the migrated 7-Mode vault in order to restore (the clustered Data ONTAP vault operates normally). Note that the three-month cutoff is a guideline, not a hard rule. The Operate phase is where you "operationalize" your new clustered Data ONTAP environment. This includes the following. Verify, upgrade, or deploy the management tools necessary to manage the clustered Data ONTAP environment. Internal processes have to be adapted to take advantage of changed capabilities and new features of clustered Data ONTAP. For example, you'll very likely want to take advantage of the ability to nondisruptively move volumes, which warrants a new process to guide administrators as to how to determine where a volume should be moved, when it should be moved, and so on. Most of these changes are small or incremental, but they shouldn't be overlooked. NetApp is working hard to bring you the right resources and assistance to streamline the transition from 7-Mode to clustered Data ONTAP. 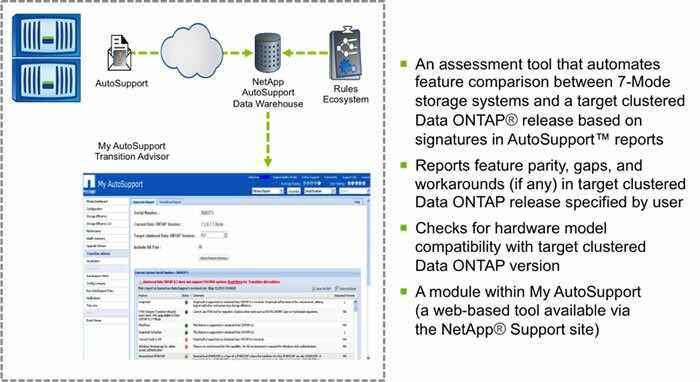 "Clustered Data ONTAP for the 7-Mode Administrator"
"Planning and Implementing Transition Using the 7-Mode Transition Tool"
"Transitioning to Clustered Data ONTAP"
Find out more by visiting the "Find Training" section of the NetApp University web pages. NetApp also offers a number of certifications for clustered Data ONTAP. Find out how to get certified. Your NetApp account team or NetApp partner can help you find additional documentation and resources to support your 7-Mode transition that is relevant to the needs of your particular environment. Jay is a Technical Marketing engineer with the Data ONTAP Group responsible for clustered Data ONTAP maximum configurations and best practices. He has authored many technical reports and FAQs related to NetApp storage subsystems, resiliency, transition, storage systems performance, and more. Since joining NetApp five years ago, Sandra has focused on a variety of important NetApp solutions, including storage efficiency, Infinite Volume, and 7-Mode transition. She has written deployment and implementation guides and technical best practices for these critical technologies. Sandra has over 20 years of industry experience, including performing similar functions at other leading Silicon Valley companies. Catalogic Software is a partner of NetApp and also has a tool, ECX Enterprise Catalog, would could add value in the assessment stage of the migration as well as after the migration. By providing analytics on the data to be migrated, you might realize some data or objects do not need to be migrated. If you are interested, you can request a one-page description of this use case by emailing info@catalogicsoftware.com. Can this method be used to transition both SAN & NAS Data ? You can copy data from the 7-Mode volumes to the clustered Data ONTAP volumes manually by using the clustered Data ONTAP SnapMirror commands. However, you must manually set up protocols, services, and other configuration on the cluster after transition is complete. Is there a way to transition VMware boot luns to CDOT using a CFT and the 7MTT?